Catherine Jinks is a four-time winner of the Children’s Book Council of Australia Book of the Year award, and has also won a Victorian Premier’s Literature Award, the Adelaide Festival Award for Literature, the Ena Noel Award for Children’s Literature and an Aurealis Award for Science Fiction. In 2001 she was presented with a Centenary Medal for her contribution to Australian Children’s Literature. The City of Orphans Series is a truly brilliant read. Described by critics as as possessing Dickensian qualities, this series is part adventure, part sci-fi. Engagingly written, with wry humor and enjoyable characters, the City of Orphans Series is available now at Newcastle libraries. 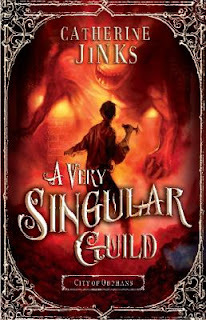 The final two books - A Very Peculiar Plague and A Very Singular Guild are also available as e-books. Monsters have been infesting London’s dark places for centuries, eating every child who gets too close. That’s why ten-year-old Birdie McAdam works for Alfred Bunce, the bogler. With her beautiful voice and dainty looks, Birdie is the bait that draws bogles from their lairs so that Alfred can kill them. One life-changing day, Alfred and Birdie are approached by two very different women. Sarah Pickles runs a local gang of pickpockets, three of whom have disappeared. Edith Eames is an educated lady who’s studying the mythical beasts of English folklore. Both of them threaten the only life Birdie’s ever known. But Birdie soon realises she needs Miss Eames’s help to save her master, defeat Sarah Pickles and vanquish an altogether nastier villain. 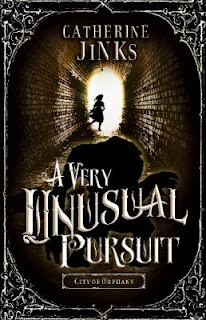 Eleven-year-old Jem Barbary spent his early life picking pockets for a canny old crook named Sarah Pickles. Now she’s betrayed him, and Jem wants revenge. He also wants to work for Alfred Bunce the bogler, who kills the child-eating monsters that lurk in the city’s cellars and sewers. But Alfred is keen to give up bogling, since he almost lost his last apprentice, Birdie McAdam. When numerous children start disappearing around Newgate Prison, Alfred and Jem do join forces, waging an underground war. They even seek help from Birdie, dragging her away from the safe and comfortable home she’s found with Miss Edith Eames. 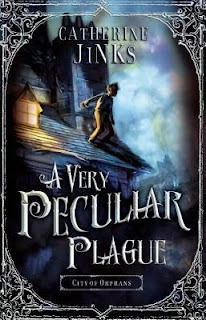 Together they learn that there’s only one thing more terrifying than facing a whole plague of bogles – and that’s facing some of the sinister people from Jem’s past . . .
Twelve-year-old Ned Roach used to scavenge for scraps along the Thames riverbank. But the recent plague of child-eating bogles in London means that he’s now working as an apprentice to Alfred Bunce, the bogler. Alongside Jem Barbary and (sometimes) Birdie McAdam, Ned must lure bogles out of their lairs so that Alfred can kill them. And this means spending a lot of time in the city’s murky underground waterways – especially when Alfred is hired by the London Sewers Office to stamp out a deadly infestation. But times are changing. As magic and folklore give way to the machine age, Alfred begins to face an uncertain future – while Ned and his friends find themselves threatened by an enemy from their past who’s even more dangerous than the bogles.